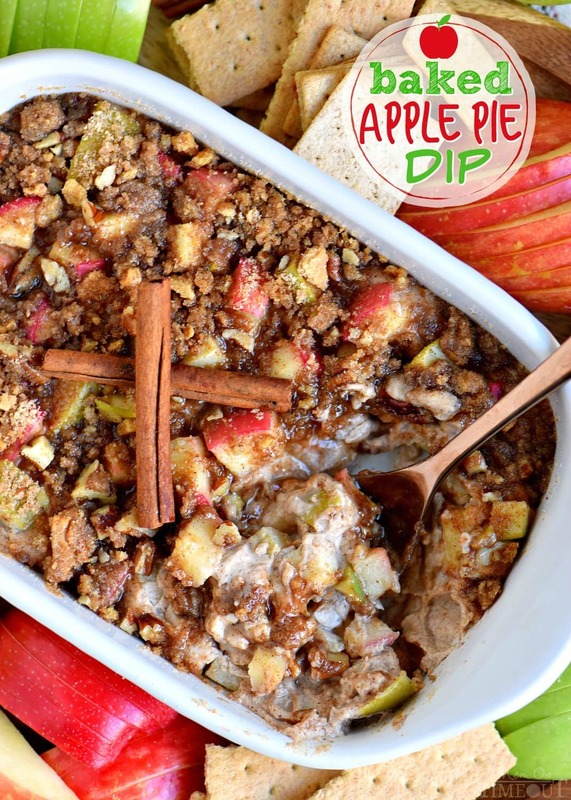 This easy Baked Apple Pie Dip is made with fresh apples, cream cheese, brown sugar and spices! Topped with a pecan-graham cracker streusel, it’s perfect for a party, after-school snack or easy dessert. This is one recipe I plan on making every chance I get! Anybody else a big fan of dips?? I seriously cannot get enough of them. Not only are they the most sought after appetizer at parties, they’re by far the easiest to make. 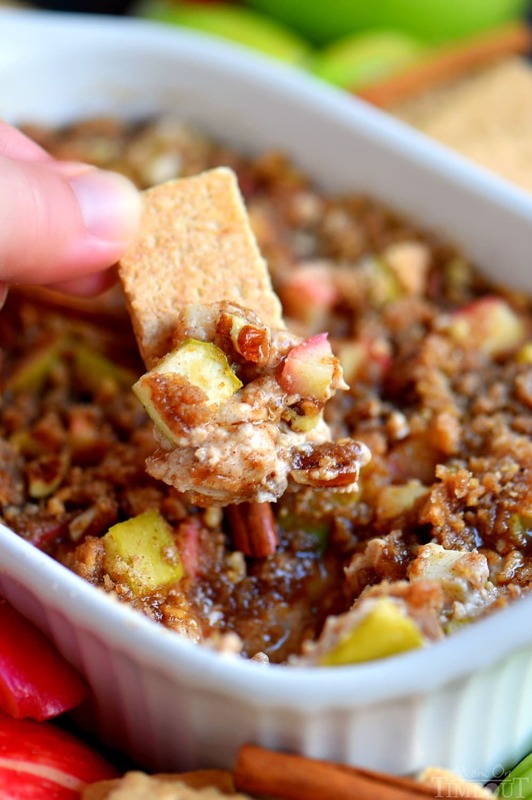 Today I’m sharing my new favorite fall dip. It could easily be used as an appetizer, dessert, or snack – your call. The best part? It’s so easy and you probably have most, if not all, of the ingredients on hand already. 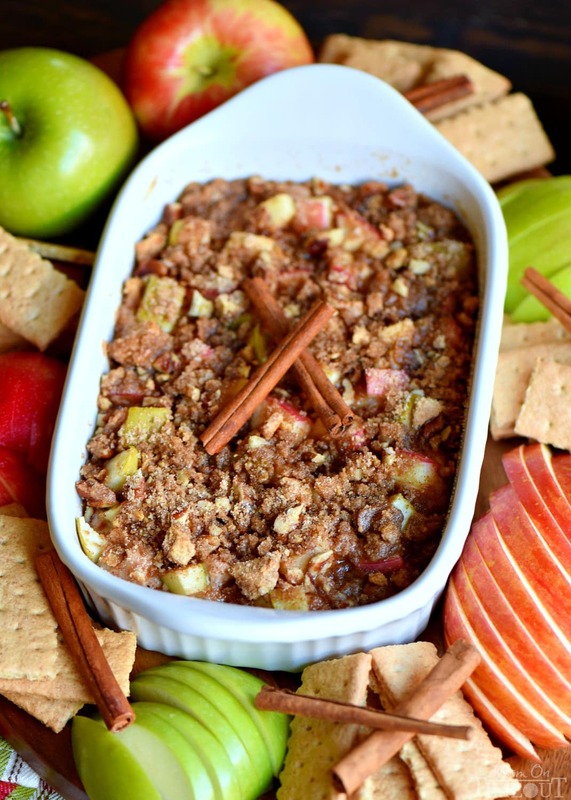 The dip is LOADED with apples and spices and then topped with a pecan graham cracker crumble. Pretty irresistible. I think we all know that the best thing about dips are the dippers themselves. I laid out an assortment of fresh apple slices, HONEY MAID Grahams, and WHEAT THINS Snacks that I picked up at my local Raley’s store. My boys can inhale a box of WHEAT THINS Snacks at a single swim meet and HONEY MAID Grahams are their after-school snack of choice. With 8g of whole grain per serving and no high fructose corn syrup, they’re a great way to get in the recommended 48g of whole grains a day. Paired with a yogurt, they’re good to go for soccer practice later. I love setting out an assortment of dippers with this dip. It gives everybody options! I am loving everything about this dip and I know you will too! 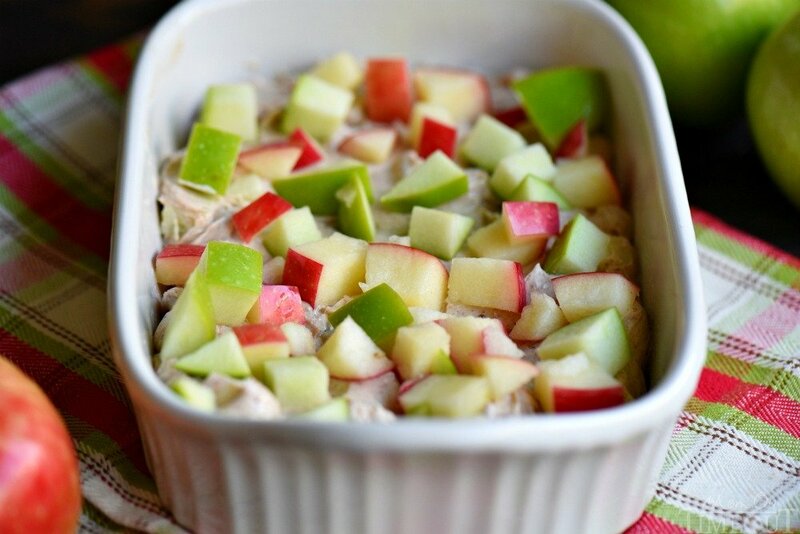 It’s bursting with fall flavor – sweet, creamy, crunch, this easy apple pie dip has it all! NABISCO and Raley’s are making it easier to get the recommended 48g of whole grains with simple and tasty recipes like this one! 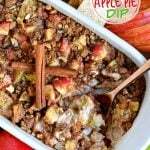 This easy Baked Apple Pie Dip is loaded with apples and spices! Perfect for a party, after-school snack or easy dessert. This is one recipe I plan on making every chance I get! Spray a small, shallow baking dish with cooking spray and set aside. Combine flour, sugars, and apple pie spice in a medium bowl. Stir in graham cracker crumbs and chopped pecans. Refrigerate streusel until you are ready for it. In a medium bowl, beat cream cheese, brown sugar and apple pie spice into smooth and creamy. Stir in 3/4 cup chopped apples. Spread the mixture onto the bottom of the prepared dish. Sprinkle remaining apples on top. Bake 12 to 15 minutes or until heated through. 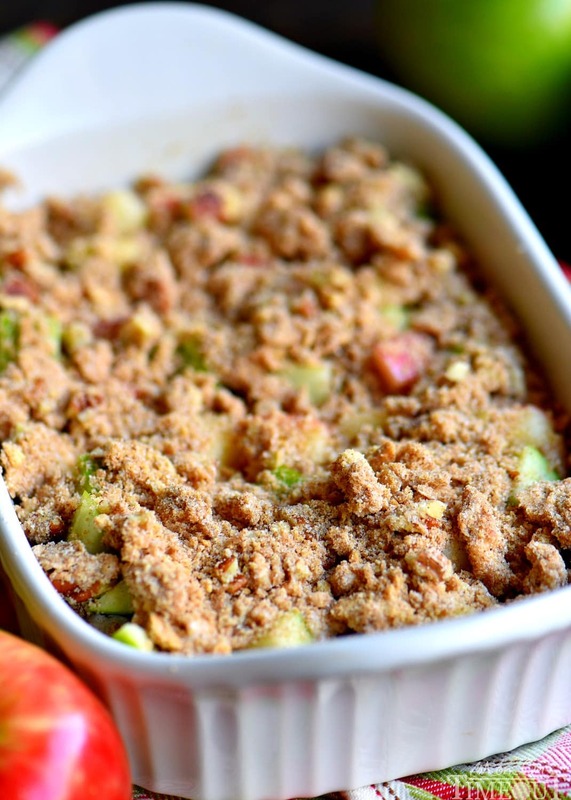 Serve with graham crackers and apple slices. For all apple ideas, go HERE. Disclosure: I was provided compensation for this post by NABISCO and Raley’s, but all opinions are, as always 100% my own. Looks great. Will need to try this at home. What a fabulous fall treat! Have you ever made this ahead of time, and baked later? I need something to take for Book club but have to work all day, I thought about making it that morning and then throwing it in the oven after work? Do you think the apples will get yucky? Whats your advice??? thanks!! I can’t wait to dip into this! I bet it smells amazing too! This looks like a fantastic Fall dip!! Trish I’m dreaming about this already!! Your photos are just gorgeous!